7 appears in so many facets of our lives and we rarely give it much notice. It's simply a number right? Yes, quite frankly it's just a number. But don't we all have that feeling inside us that something brings us luck or guides us in a way we can't explain? 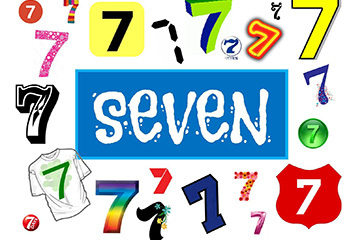 The number 7 represents a multitude of things in the world of media, marketing and various other related categories. As you read below, a book that's very popular and extremely useful, The 7 Habits of Highly Effective People, takes the number 7 and breaks down some helpful areas to focus on for success. From an arbitrary standpoint the number 7 can represent a favorite athlete, mythology, music, gambling and so much more. And 7 plays a major role in various religions. But for the purposes of 7 Media Group it's simply a means to represent various ideas, terms and other media-related concepts. We hope 7 becomes an important number in your life as well.